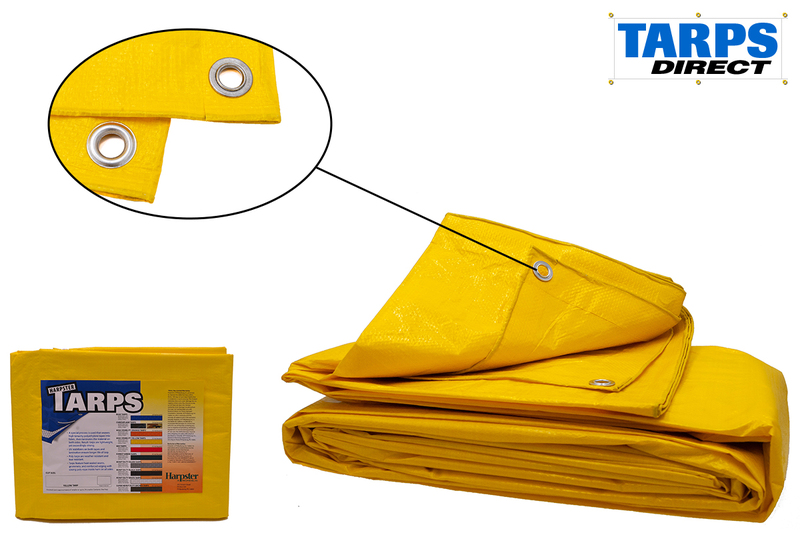 Our 3.3 ounce yellow poly tarps are both water and mildew proof as well a tear and acid resistant. Constructed of 7-8 mil thick laminated polyethylene with a fabric weave count of 10x10, these tarps are lightweight, durable and one of the brightest tarps on the market today. Perfect for any situation that needs to stand out! Grommets are spaced approximately every 36 inches on all sides for your convenience. Yellow poly tarps are slightly heavier than our economy blue tarps. Our yellow tarp is not fluorescent, but is bright enough to draw attention. This makes it perfect for any application where a reflective or eye catching material would be useful. 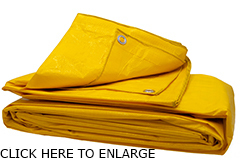 Yellow poly tarps also are used by airports to use along runways. Customers have found creative ways to use these tarps in unconventional ways - think exterior decorating! Along with these great ideas, our yellow poly tarps are great for covering a load, protecting property and helping in any activity where a tarp would be needed.